We are committed to provide our customers with the highest quality of service. We are committed to provide our customers with the highest quality of service. With the support of our existing and prospective clients, we are heading towards becoming one of the largest insurance companies in Pakistan in the upcoming years. PICIC Insurance is determined to provide excellent services in all classes of Insurance. It is our goal to become the leading insurance provider and advisor to our clients. PICIC Insurance Limited is a general insurance company writing all classes of general insurance business. 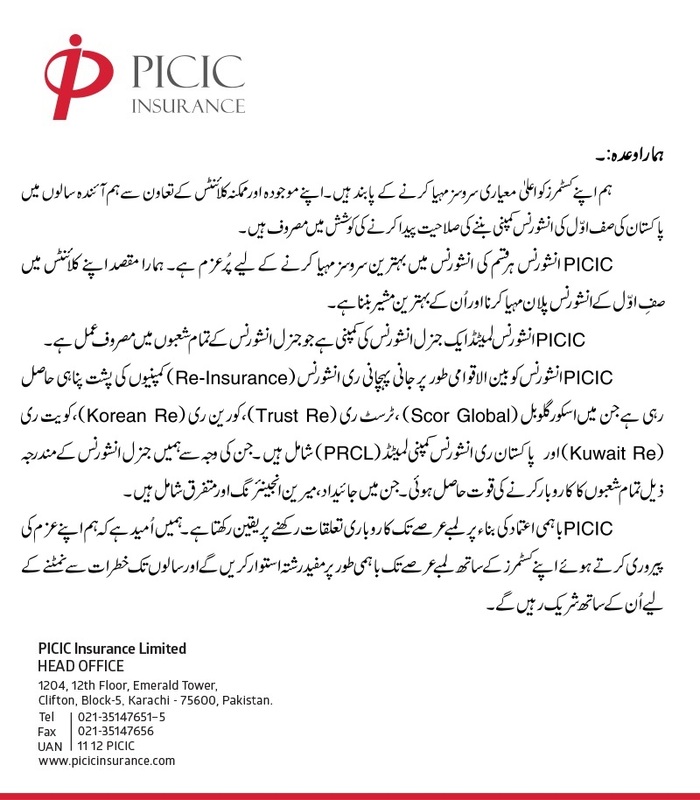 PICIC Insurance is backed by very renowned international reinsurers such as SCOR Global, Kuwait Re, Korean Re, Trust Re, Swiss Re and Pakistan Reinsurance Company Limited (PRCL). This gives us the strength to underwrite business in all classes of general insurance including Property, Marine, Engineering and Misc..
PICIC believes in a long lasting business relationship based on mutual trust. We are hopeful of establishing a long and mutually beneficial relationship with our sole aim to serve our customers beyond excellence as risk partners for the ensuing years.